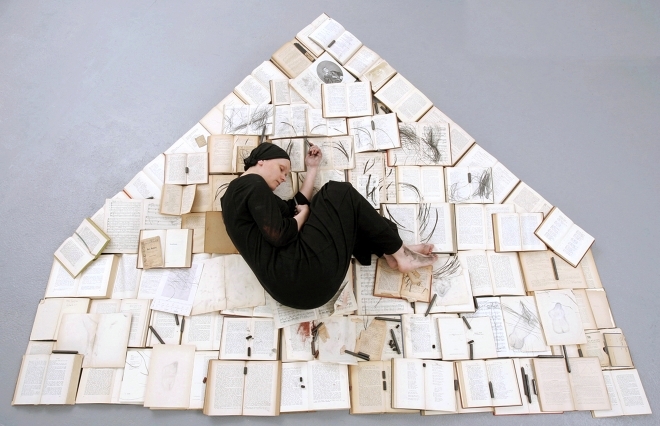 The Kunsthaus Dresden invites artist Monika Weiss to create a new work in her Phlegethon-Milczenie series as part of Remembering & Forgetting: #WOD Cultural Festival, Dresden, Germany. From February 10th to February 19th the citizens and visitors of Dresden are invited to experience artistic projects, to meet and become part of this initiative for the freedom of art and people, for respect and openness. Yellow containers will be placed for ten days on Neumarkt, Altmarkt, Postplatz, and Theaterplatz – public squares, which have often witnessed destruction and other acts of aggression in the past. On the occasion of remembrance of the destruction of the city of Dresden in 1945 and in keeping with the motto »Remembering & Forgetting«, #WOD aims to reflect on the interconnections of past, present and future, on the forms of remembrance and on the relationship of freedom, identity and diversity by inviting us to experience Dresden’s central squares as places of dialogue. The performance and installation of the Polish-American artist Monika Weiss, named after the mythological river Phlegeton, carrying fire instead of water, brings back memories of book burnings as well as of the historical and current prosecution of humans and their thoughts globally. Lootings, burnings of books and brutal detentions in March 1933 on Wettiner Platz in Dresden were followed by book burnings in many other german cities two months later. Participating artists incude Norbert Bisky, Daniel Kiczales, Iva Kovic, Jan Kunze, Henrike Naumann, Susan Philipsz, Monika Weiss. Participating institutions include: Ostrale, Kunsthaus Dresden, riesa efau. Kultur Forum Dresden, Technische sammlungen Dresden, staatliche Kunstsammlungen Dresden, Hochschule für bildende Künste Dresden, Staatsschauspiel Dresden.